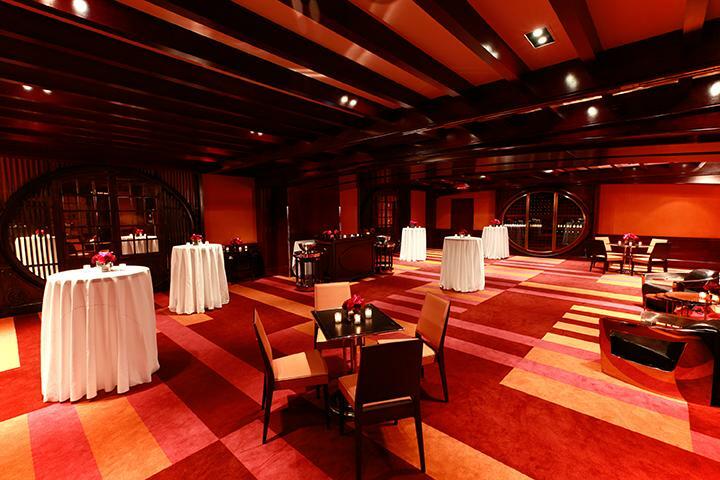 Rent The Lambs Club | Corporate Events | Wedding Locations, Event Spaces and Party Venues. With carefully crafted menus, custom designed service ware and the utmost attention to detail Chef Geoffrey Zakarian's signature style of hospitality make gatherings at The Lambs Club quite special. This private event space, adorned with distinctive Landmarked elliptical doors and ultra-luxe finishings, may be split in half and converted into two smaller event rooms. In addition, a gracious foyer can be utilized for receiving guests or offering break service. The space comes with a dedicated bar, private restrooms, coat check, A/V capabilities and an independent sound system and can accommodate up to 125 for a reception, up to 120 seated, and up to 150 theatre style. Tucked away to the side of The Bar is a discreet landmarked room known as The Stanford White Studio. Previously the site of The Lambs Club library, all of the space's original materials including the paneled oak walls, bookcases and coffered ceilings have been painstakingly restored and fit piece by piece back into place. Now a private hideaway, The Stanford White Studio and terrace can be utilized for unique gatherings, drinks, and small dinners. The space is a jewel-box from the past outfitted with modern amenities. Stanford White Studio can accommodate up to 36 seated and up to 60 for a reception. Featuring a fully restored 18th Century French limestone fireplace, black and white photos of Broadway and Hollywood royalty, chrome light fixtures and hand crafted leather banquets, The Lambs Club restaurant has an elegant clubhouse feeling. The Restaurant can accommodate up to 100 seated and up to 150 for a reception. On the 2nd Floor overlooking the lobby, the spacious lounge can be used for a variety of functions. The comfortable seating offers an easy place for daytime meetings, break out space and weekend brunches whereas the Empire Deco bar can serve as an impressive anchor for any cocktail event. The Bar can accommodate groups of 20 to 175 guests.